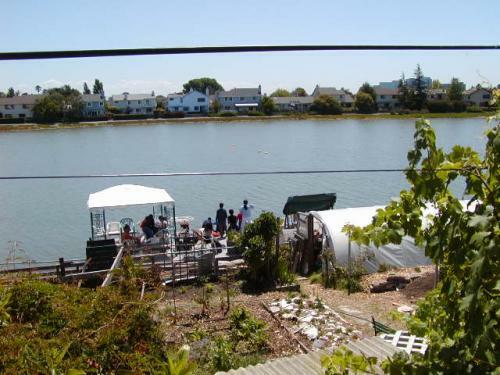 We are a small suburban community facing a lagoon between San Mateo and Foster City, California. We purchased a four-unit building in 1998 and after seven years of waiting, in 2005, we purchased the second building. We have planted fruit trees and extensive organic gardens, are beekeepers, and in 2012 added aquaponics. We are a cooperative—something between intentional community and cohousing, though we identify most with the concept of a mini-ecovillage. We had hoped to have co-owners but the mortgage market has made that difficult, so this is mostly a community of renters. In 2015, 72% of the second building was sold to three other co-owners, including a couple who had been renting for a few years. We have worked to help develop more of a community within the local neighborhood. The location is wonderful: lots of birds, sunrise over the water, nearby biking/walking path, park with playground, tennis/basketball courts, and city amenities of proximity to freeway and public transportation, etc. Values we would like to see "grow" on this site can be summed up in the concept of sustainable development: growing some of our own food; supporting local organic farmers in farmers' markets or in a community-supported agriculture (CSA); reducing, reusing, recycling; avoiding buying food and other items that contribute to the destruction of local economies and the environment. We want to share time in the garden, meals at the dinner table, and other activities with the people we live with. We seek open communication and a deep expression of feelings. We expect those wishing to join us to have a commitment to these values and goals as well. Community founders are also very involved in progressive politics, and although not a requirement, would welcome people who share their passion for planetary transformation.